Italy has enticed tastebuds around the globe for centuries, with pizza and pasta topping the list for the most popular foods in the world. Family, food and tradition are the best things in life and the best things in life are meant to be shared. Just outside Rome, a young man grew to know the art of flavour so that by the time he established his first restaurant he had not only mastered the family craft, but could do so in a foreign country. Sergio Checchi opened the doors to Made in Italy in 2000, inviting Australians to travel by taste to the cobblestones of his home town of Subiaco, Italy. 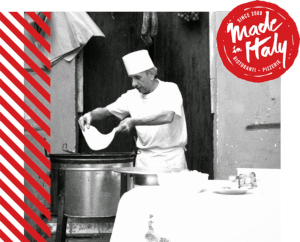 Sourcing only the best, fresh and local ingredients we continue to create recipes that would make our Nonnas proud. Honouring the important ritual of sharing food and each other’s company, we promise to feed you like family.